These Scones. I’m telling you. 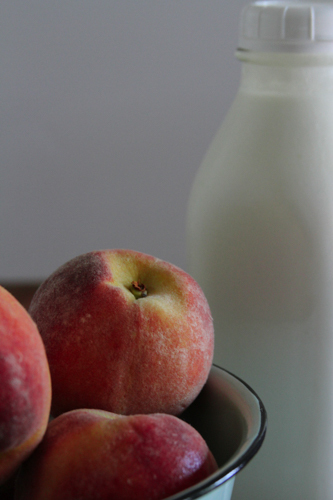 If you’re like me and still lusting for peaches constantly, all too aware of the season that will soon end, here is a recipe you will want to have on hand. 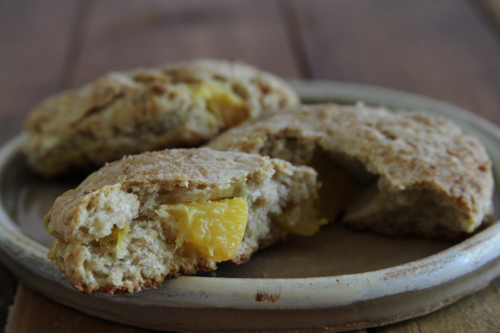 The combination of beautiful yellow peaches with tangy cream cheese in this fairly healthy scone (you know I love whole wheat flour) makes the perfect breakfast treat with a cup of coffee or a nosh with afternoon tea. 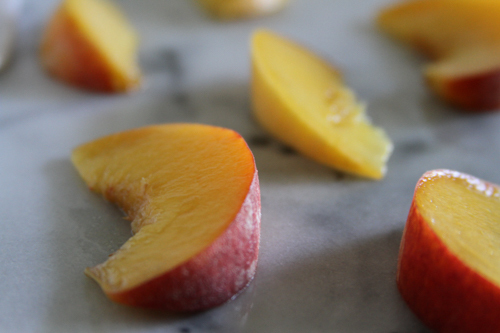 They also freeze amazingly well so you can make a batch, freeze some for later and bake when you’re ready. I’m always drawn to recipes that are versatile. You want to stuff your face and eat every last one of those scones now? Go for it. Who’s stopping you? You want to have breakfast at the ready for a couple of days but freeze some off for company staying with you later in the week? That works too. 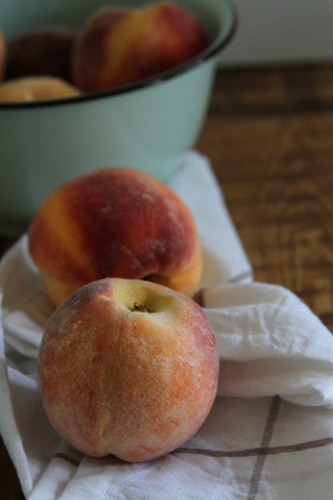 The one cautionary note I will make is that you want to use peaches that smell amazing and are ripe but you don’t want peaches that are becoming overly ripe, they’re too juicy for this. If you give the peach a slight squeeze and it gives a bit but still has structure, you’re good to go. If you squeeze and make a big greedy fingerprint, it’s too ripe. Preheat the oven to 425 degrees Fahrenheit. Whisk flour, salt, sugar, cinnamon, baking powder, and baking soda together in a large bowl. In a separate bowl or large glass measuring cup add the buttermilk and cubes of cream cheese. Give it a quick stir. Refrigerate the buttermilk/cream cheese mixture while you start the dough. Add the grated cold butter to the dry mixture and toss well to combine. 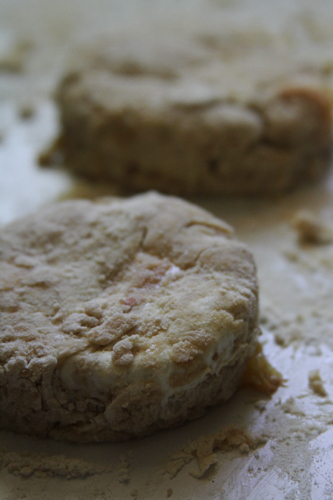 Use your fingers to pinch the butter into the flour until the mixture is crumbly and the butter is well incorporated. Work quickly so the cold butter doesn’t warm too much from the heat of your hands. Add the diced peaches and buttermilk mixture. 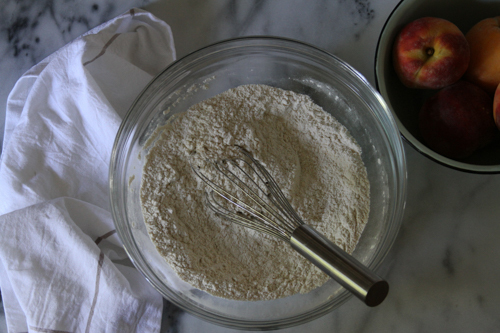 Fold the wet ingredients and fruit into the flour just until combined. The dough will be very crumbly. That’s okay and exactly what you want in this case. Do not overmix (it will be tempting). Turn the dough out onto a floured work surface. Pat it together into a large round, about 1 inch thick. Pat it on top also to even the thickness of the dough. Using a pastry cutter, cut out rounds (or triangles) and place the scones on a rimmed baking sheet lined with parchment paper. Don’t let any of the dough go to waste! As you run out of room to cut more rounds, pat the dough into a smaller circle and continue cutting out rounds. 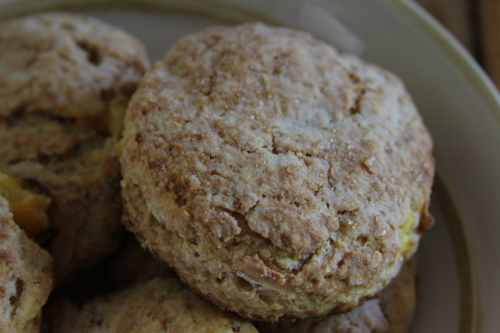 You should be able to get 10-11 scones out of the batter, using all of the dough. 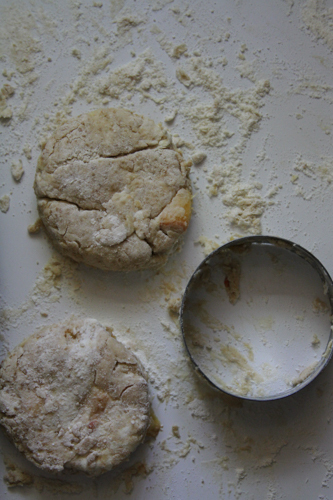 Brush the tops of the scones with the melted butter. Sprinkle the scones with coarse sugar. Bake 18-23 minutes until golden brown. Remove scones from the oven and let them cool a few minutes on the pan before transferring them to a wire rack to cool for 10 minutes.